As president of the IndianAcademy of Neurology (IAN) (2004-2005), I was disturbed by the fact that the WFN sponsored CME program had a weak presence in Asia, particularly India. This stimulated me to take over the reins as coordinator for this program in India. As per the advice and guidelines provided by Ted Munsat, I initially started the program in Mumbai. The first CME was held on July 17, 2005, on the topic of multiple sclerosis. From the feedback given by the postgraduate students, it was evident that they enjoyed the CME and found it to be unique and useful. Considering the success of the program in Mumbai, I decided to “export” the program to other centers in India. I have received enthusiastic support from my colleagues in nine centers all over India: R. S. Wadia (Pune); C. S. Meshram (Nagpur); S. Prabhakar (Chandigarh); J. S. Kathpal (Indore); S. K. Jabeen/Subhash Kaul (Hyderabad); Mutharasu (Chennai); P. C. Gilvaz (Thissur); Birinder Paul/Gagandeep Singh (Ludhiana) and P. S. Gorthi (New Delhi). I would like to thank them for their support in making this program a success in India. In all these centers, the postgraduates, young and senior neurologists and internists attend these CMEs depending on the topic of discussion. Usually the postgraduates take up each chapter of the continuum highlighting the “take-home” messages. They are usually coupled with a consultant who highlights the salient points and gives the Indian perspective because of the geographical differences in the pattern of neurological diseases. It is difficult coordinating nine centers in India, but gentle reminders are sent to each coordinator at three- and six-month intervals about their “backlogs.” What really works is a message that we owe the WFN and AAN a debt of gratitude for the gift of these issues of Continuum. Filling out the evaluations forms is just a small way of showing our appreciation. We have been able to get 659 evaluation forms for the year 2012 and 823 for the year 2013. For the last two years, I got accreditation from the Maharashtra Medical Council (MMC), and they give two credit hours to every participant. This is an added incentive to attend at least in Mumbai and the other two centers in the state of Maharahtra (Pune and Nagpur). No program can be sustained without some financial support. I was fortunate to get a generous grant from the Australian Association of Neurologists for a sum of $5,000 (Australia) in August 2005 and again in July 2006. We have used these funds frugally to send the evaluation forms to the U.K. and to courier the journals to the various centers in India. The balance funds are now low and soon we may need more funds. We also are fortunate to get an unconditional educational grant from Intas Pharma, which has supported these CME session in many centers across India — particularly Mumbai. On behalf of the IAN, I would like to thank them for promoting neuro-education in India. I also would like to thank Satish V. Khadilkar who shares the responsibility of coordinator with me in Mumbai with the view of taking over as coordinator for India in the near future. Katrak is the national coordinator of WFN CME program in India. The World Federation of Neurology (WFN) is a huge and complex structure, representing neurologists worldwide. 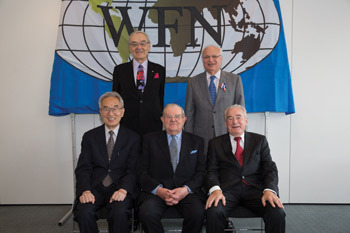 To achieve its aim, many international neurologists collaborate and work on WFN projects, represent the organization as officers or serve as editors or authors for WFN media. These initiatives play an important role in advocating the interests of neurologists on a global scale. You can follow all of these activities and more at www.wfneurology.org. A major aim of WFN is supporting educational initiatives and encouraging global networking. The website provides a sound insight into WFN educational activities. These include WFN seminars in clinical neurology, which provide teaching and training materials and patient care guidelines. Exchange among young neurologists is encouraged by WFN through programs such as the Turkish Department Visit, and available grants and awards for young neurologists interested in extending their training internationally. Reports are published on projects such as the Zambia Project, which aims to improve medical care in Zambia. Young neurologists are encouraged to participate in the WFN, and the website lists representatives of young neurologists. A singularly interesting section is neurology for non-neurologists, which provides educational materials for areas where there is a severe shortage of neurologists. Bringing worldwide science and patient care closer together is a strong objective of the WFN. 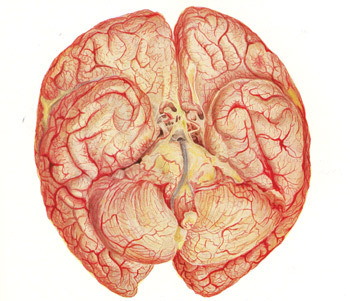 At www.wfneurology.org, you will find details on the World Brain Alliance, an umbrella group of international neurological organizations. WFN applied research groups organize scientific projects and educational activities in neurology subspecialties, and publish their activities on the website on an annual basis. The WFN website provides insights into our organization, but it offers more than that. 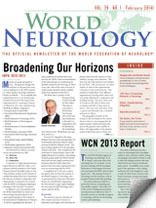 Neurology news of major global importance is published in WFN’s publication World Neurology (www.worldneurologyonline.com). Because one aim of the WFN web strategy is to establish direct interaction with its users, social media channels are offered. 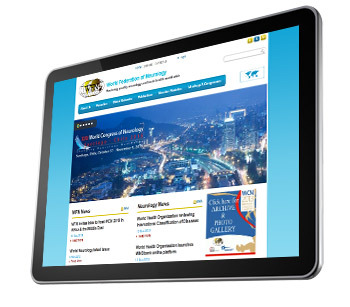 You may follow WFN updates and actively exchange your thoughts with WFN on Facebook (www.facebook.com/wfneurology), Twitter (www.twitter.com/wfneurology), or the World Federation of Neurology LinkedIn group (linkedin.com). You can use these social networks to interact and get to know other participants of the XXI World Congress of Neurology in Vienna – the first World Congress where social media channels were offered. For Twitter users, please follow our official hashtag (#) and don’t hesitate to use it in your tweets: #WCNeurology. 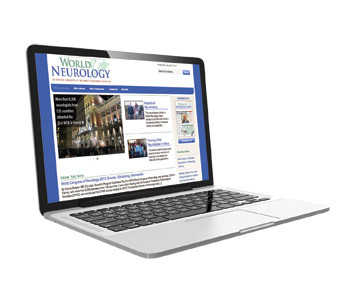 The WFN website and WFN digital footprint comprise a platform for neurologists who advocate neurology through WFN initiatives and projects, and inform the public on activities of WFN. Social media platforms offer the prospect of increased online interactivity and the hope that neurologists worldwide will interconnect more. The future vision is that these digital resources will help to build a strong network of neurologists worldwide and strengthen scientific collaboration in neurological research and services. We warmly invite you to visit www.wfneurology.org. Ted Munsat was a close and much-valued friend whom I admired as a man, as a neurologist, as a teacher, and as an administrator and lifelong supporter of the World Federation of Neurology. I first met him many years ago (more years than I can remember with accuracy) when we both attended a conference in the United States on neuromuscular disease. I recognized at once that here was a man of outstanding ability and exceptional merit. Subsequently, we corresponded, and I think we even wrote one short paper together. But perhaps my memory is sharpest of the time that he came to spend a year in my department in Newcastle. During that time, working with Peter Hudgson and others, he did some important original work leading to the publication of a number of papers, and he was widely respected and admired by the junior staff and by those working in research in the Muscular Dystrophy laboratories. He was an immensely approachable man, full of advice and sensible comments. His contributions to the department’s work were exceptional, and I remember how proud he was when his young son took up soccer at a Newcastle school and ended up playing for the junior first team, where he was regarded as one of its stars. Subsequently, I kept in close touch with him when he became head of department in Boston, and I forgave him, eventually, for stealing Walter Bradley from Newcastle to work with him, before Bradley went off to independent chairs, first in New Hampshire and later in Miami. We continued to keep in close touch, and I was impressed with the work that he did on various WFN committees, and above all his contributions to continuing education in neurology through the publication of Continuum. His wife Carla was a great charmer with a wonderful, twinkling attitude about life. They loved the social life in Newcastle, and later still, I met them both on many occasions at international meetings, and shared not only reminiscences but also their joint views about the future of neurology on a worldwide scale. Munsat has left a mark on international neurology that can never be erased, and he will be remembered by all who knew him with respect, pleasure and affection. 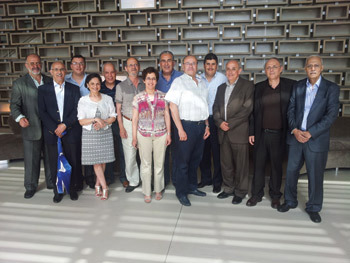 Representatives met in May 2012 to discuss developing neurological sciences in the fight against neurological diseases in Morocco. The World Congress of Neurology, organized by the Moroccan Society of Neurology in Marrakesh, November 2011, was a great success at both the scientific and organizational level. Moreover, the conference has generated substantial financial benefits for both the Moroccan Society of Neurology and the World Federation of Neurology, which will devote 20 percent of its profits to the development of neurology in Africa. Moroccan neurologists met in May 2012 and unanimously decided to devote all profits obtained by the Moroccan Society of Neurology to the creation of a foundation dedicated to the development of neurological sciences and the fight against neurological diseases in Morocco. Indeed, Morocco is experiencing a delay in neurology and care of neurological diseases even compared to countries of the same level of economic development. The number of neurologists remains low: 170 (counting the neurologists in training) for a population of 32 million. Besides, there are few hospital beds dedicated to neurology, and CT scans are only available in large cities. The country has worrying indicators in public health. Neonatal and perinatal morbidity, which remain high, are causing a large number of children to experience neurodevelopmental disorders responsible for motor and cognitive disabilities that require rehabilitation throughout their lives. In addition, urbanization, changing lifestyles and increasing life expectancy have caused a rapid epidemiological transition that led to an increase in diseases related to aging. Thus, an epidemiological survey conducted in Rabat and Casablanca in 2009, showed that the prevalence of stroke in people aged 65 years and older was 25 per 1,000. This is almost equal to that found in industrialized countries. As for dementia, the report of the WHO in 2012 estimated the number to be 100,000 cases. Also, Morocco suffers from an unusually high number of road traffic accidents responsible for head injuries and neurological disorders. By its bylaws, the Moroccan Foundation of Neurology is a non-profit organization that can receive donations from persons, associations and governments to accomplish its objectives. The foundation also aims to develop cooperation with other similar institutions in Africa and in the Arab world to improve neurological care in these regions. The Moroccan Foundation of Neurology, with active support from the World Federation of Neurology, the World Health Organization and other international institutions, will undoubtedly succeed in its mission to improve the lives of patients with neurological diseases. It is an honor to write to you as the 10th president of the WFN. I follow a long and distinguished line of presidents over the past 56 years. Each president has complemented and strengthened the work of his predecessor and added his own touch to maintain the upward curve of our federation and carry on the torch of neurology. Our history is indeed illustrious and glorious thanks to their achievements. It was a great opportunity to have four previous presidents join me in Vienna. (See photo on page 14.) Unfortunately, James Toole was unable to join us. The contributions and wisdom of all of our presidents will be our guide for the future. Our predecessors have laid out the path. As president, I will move full speed ahead with determination to carry out the tasks entrusted to me and to all the trustees. The newly elected officers — William Carroll (Australia) as first vice president and Wolfgang Grisold (Austria) secretary-treasurer general — have vast experience and the zeal to work. Gallo Diop (Senegal) is the first sub-Saharan African trustee, and he will add another dimension to the group. Since my first involvement with the WFN over 33 years ago, I have learned that the way to make progress is to bring neurologists together, and to respond to their requests to be put in touch with colleagues. In an electronic world, communication is instantaneous and those with ideas may be anywhere in that world. To provide access to others with similar interests but who perhaps live in communities where the technology and financial support is different is what the WFN is all about. My task and that of my fellow trustees is huge and daunting. As I said in my election statement, my plan is to involve all societies and their members in our activities. This will need openness and transparency to achieve inclusivity and collaboration. Transparency of our decisions is vital and will be adhered to in the years to come. As new trustees, our plan of action will be formulated in the first year of office, and we will fulfill our responsibilities with the diligence that the Council of Delegates expects of us. At least for me, and I hope for the WFN, the elections in Vienna were a turning point toward Global Involvement Through Regional Empowerment. This in my opinion is crucial for the future success of the WFN. We now live in a world of change both in our scientific understanding of our speciality and the need for cooperation between all our six regions. Many will need to interact closely with each other for advancement of their scientific progress, education, training and provision of care to patients. This needs an organizer, a go-between, a fixer, and the WFN can and should be all of that. Collaboration through WFN member societies is possible because we all have the ability to help each other and strong reasons to do so. Moreover, our neurology specialty associations are also strong and willing to participate. This is the way forward. The newly elected trustees started work in earnest in January by holding a first meeting at the headquarters in London. It brought together the regional directors and chairs of initiatives, and will culminate in the reconfiguration of our committees. The work will begin immediately. I think that the outcome will determine our future for the next four years. I am under no illusion about the seriousness of the task ahead but with widespread advice and participation, I am confident we will identify the priorities for the future. The WFN is but one of the organizations necessary to achieve these goals. It will do its best to be the catalyst and listen to all stakeholders. We have inherited a wonderful set-up from all our predecessors, and we should rise to the challenge to harness our legacy and add as much as we can with everyone’s support. As secretary-treasurer general for the last seven years, I have learned that change is important and necessary, but in order to be implemented successfully it has to have relevance and be introduced with the agreement of the stakeholders. This will be possible with the involvement of all our members. The new trustees have made clear commitments in their manifestos, which were clearly endorsed by the Council of Delegates. We will all work, consult, have our different points of view and then come to the appropriate collective conclusions. We will all work hard to justify the trust placed in us. Almost 80 delegates and representatives assembled Sept. 22, 2013, in Vienna, for the Annual General Meeting of the Council of Delegates. They arrived for registration to be greeted by a colorful oriental display from the three cities bidding to host the 2017 World Congress of Neurology — Hong Kong, Kyoto and Seoul. The importance of the occasion was evident to everyone, even more so because, in addition to the selection of the WCN 2017 venue, delegates were asked to choose three new officers and one new elected trustee. As well as presentations from the three member societies, delegates heard an assessment from the Federation’s Professional Congress Organizer (PCO) and received reports from members of the site visit team to help them make up their minds. It was a difficult choice, but eventually Kyoto won the day. Delegates also received reports from officers and committee chairs, including chairs and co-chairs of the Education and Applied Research Committees. The former gave a PowerPoint presentation of the activities of the Education Committee, including the development of standard operating procedures for committee activities, such as the monitoring of educational grants, departmental visit programs, and teaching center accreditation. Donna Bergen, chair of the Applied Research Committee, reported that new Applied Research Groups have been established on coma, neuro-oncology and neuro-infectious diseases. The Membership Committee has proposed the introduction of a category of Pending Membership to speed up the process of assimilating new societies into the Federation. 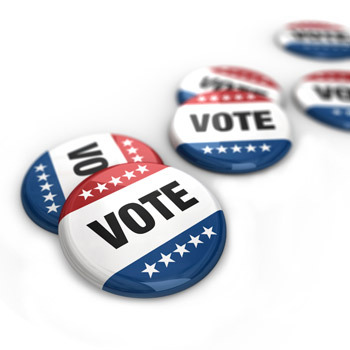 Only voting rights will be temporarily withheld until all formalities are completed. This year, three new societies joined the WFN — Oman, Tanzania and Uzbekistan — bringing the total number of neurological associations in the organization to 117. By common consent, the Vienna Congress was a resounding success. Planning for Chile 2015 has already begun; Kyoto, Japan is our destination in 2017; and members are now urged to think ahead to 2019, when we return to the region of Africa or the Middle East for our biennial World Congress of Neurology. Nanoparticulate matter and related materials possess an inherent capability to efficiently and effectively cross the blood brain barrier (BBB) leading to an increased concentration of encapsulated bioactives and drugs in the cerebrospinal fluid (CSF). In addition to drug delivery, this BBB crossing ability of the nanoparticles can be employed to develop various real-time diagnostic tools. Taking these benefits into consideration, nanotechnology has immense potential such as in the field of neuromolecular diagnostics, discovery of neurodegenerative markers, nano-enabled drug delivery and neuroactive discovery with implications reaching to the prevention, management and treatment of neurological disorders. In this way, the BBB can be circumvented via systemic administration or CNS implantation with an ability to control as well as target the release of various bioactive agents used in the treatment of neurodegenerative disorders (NDs). 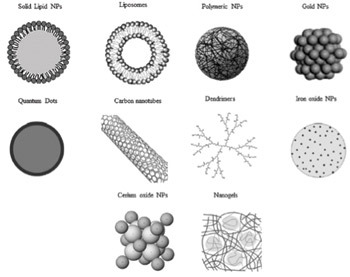 The majority of nanotechnological drug delivery systems for the treatment of NDs are in the form of polymeric nanoparticles. Polymeric nanoparticles are promising for the treatment of NDs as they can pass through tight cell junctions, cross the BBB, achieve a high drug-loading capacity, and be targeted toward the mutagenic proteins. Specific nanosystems explored for advanced experimental treatment of Alzheimer’s disease (AD), Parkinson’s disease and other CNS disorders are listed in Table 1. Nano-enabled systems in the form of biodegradable and non-biodegradable templates for regeneration of damaged neurons and peptide-based self-assembling molecules have been employed as scaffolds for tissue engineering, neuroregeneration, neuroprotection and photolithography etching5. 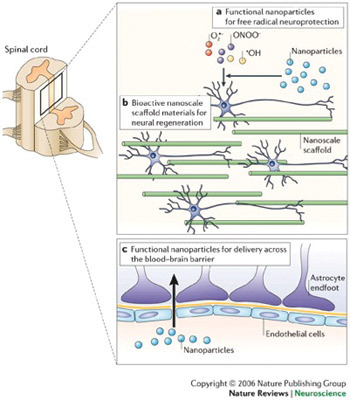 Nanoparticulate strategies in the form of bioactive nanoparticles are being employed to provide resealing, repair, regeneration, restoration and reorganization of neural tissue after traumatic spinal cord injury. Nanoparticles are capable of achieving this via the control of secondary injury cascade, reassembly of the tethered membranous structures, creating a neuropermissive microenvironment, rebooting the neuropathophysiologica; connections, and recovery of the sensorimotor responses6,7 (See Figure 3.) Silva and co-workers, 2004, reported the potential of self-assembling peptide nanofibers (SAPN) in neural tissue engineering wherein the nanofibers provided the “neurite-promoting laminin epitope IKVAV,” thereby inducing a rapid differentiation of cells into neurons via the amplification of bioactive epitope presentation and further restricting the development of astrocytes8. the unwanted severe side-effects due to preferential uptake of drugs by peripheral cells. The introduction and application of nanotechnological strategies may help in overcoming and even completely removing these neurotherapeutic challenges5. Vauthier and co-workers, 2003, suggested that nanoparticle adhere to the cell membrane with subsequent escape by the P-glycoprotein efflux system to reach the CNS11. These contrasting reports may lead to delay in regulatory approval of these promising nanosystems, and hence, further research into the exact elucidation of the mechanism of nanoparticle transport across the BBB is required. the design and integration of specific nano-enabled applications to the CNS which take advantage of the first two points. important for neurosurgeons, neurologists and neuroscientists to contribute to the scientific process along with pharmaceutical scientists and engineers. True to the highly interdisciplinary nature of this area of research, it is important that technological advancements occur in conjunction with basic and clinical neuroscience advancements5. Modi is professor and head of Neurology, and the academic head of clinical neurosciences, Faculty of Health Sciences, University of the Witwatersrand. Pillay is professor of Pharmaceutics, Faculty of Health Sciences, University of the Witwatersrand. Modi G, Pillay V, Choonara YE. Advances in the treatment of neurodegenerative disorders employing nanotechnology. Ann NY Acad Sci. 2010;1184:154–172. Re F, Gregori M, Masserini M. Nanotechnology for neurodegenerative disorders. 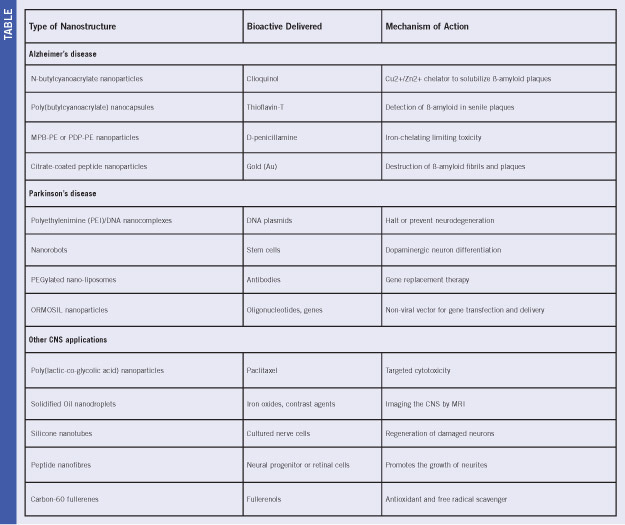 Nanomedicine: NBMedicine 2012;8:S51–S58. Orive G, Anitua E, Pedraz JL, Emerich DF. Biomaterials for promoting brain protection, repair and regeneration. Nat Rev Neurosci. 2009;10:682-692. Modi G, Pillay V, Choonara YE, Ndesendo VMK, du Toit LC, Naidoo D. Nanotechnological applications for the treatment of neurodegenerative disorders. Prog Neurobiol. 2009;88:272–285. Kumar P, Choonara YE, Modi G, Naidoo D, Pillay V. Nanoparticulate strategies for the 5 R’s of traumatic spinal cord injury intervention: restriction, repair, regeneration, restoration and reorganization. Nanomedicine, Manuscript accepted, In press, To be published in Feb 2014. Silva GA. Neuroscience nanotechnology: progress, opportunities and challenges. Nat Rev Neurosci. 2006;7:65-74. Kreuter J, Ramge P, Petrov V, Hamm S, Gelperina SE, Engelhardt B, Alyautdin R, von Briesen H, Begley DJ. Direct evidence that polysorbate-80-coated poly(butylcyanoacrylate) nanoparticles deliver drugs to the CNS via specific mechanisms requiring prior binding of drug to the nanoparticles. Pharm Res. 2003;20: 409–416. 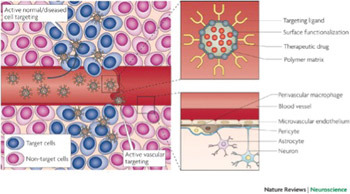 Kreuter J, Shamenkov D, Petrov V, Ramge P, Koch-Brandt C. Apolipoprotein-mediated transport of nanoparticle-bound drugs across the blood–brain barrier. J Drug Target. 2002;10:317–325. Vauthier C, Dubernet C, Chauvierre C, Brigger I, Couvreur P. Drug delivery to resistant tumors: the potential of poly(alkyl cyanoacrylate) nanoparticles. J Control Release 2003;93:151–160. There are many days related to neurological diseases being celebrated by professional organizations in collaboration with the World Health Organization, national organizations and local health ministries, including World Stroke Day, Epilepsy Day and Rabies Day. These days have proved to be extremely helpful in promoting public awareness and generating advocacy throughout the globe including non-developed Asian and African countries. For example, the World Stroke Organization announced a global competition for public awareness and advocacy campaign focusing on World Stroke Day. In 2012, Brazil, and in 2013, Sri Lanka won the competition creating a huge impact at the national level as well as the regional level. All of the days related to neurology are linked to neurological diseases. A few years ago, Vladimir Hachinsky, then-WFN president, asked, “Why don’t we celebrate a day for the healthy brain?” The human brain is so fascinating and is so closely linked to the health of the whole human being that we should promote healthy brains. The future of this universe is linked to our brains so we should start a global campaign with the slogan: “Our brains, our future.” This was suggested by the Public Awareness and Advocacy Committee. Because the World Federation of Neurology was established on July 21, the Public Awareness and Advocacy Committee suggested that World Brain Day should be celebrated on the same date. This proposal was announced at the WCN Council of Delegates meeting in September, and the proposal was received with a warm welcome by delegates; Hachinsky; Raad Shakir, WFN president-elect; Werner Hacke, WFN vice president; and other officials. Our target audience is young brains throughout the world, and we want to promote healthy brain and brain health. Young students and minds are highly interested in knowing how the brain works and how can we make it work better. We should target to approach one billion people around globe to educate about the brain in 2014. Most activities will focus near World Brain Day but it is a year-long campaign. National societies should plan activities aimed at young school and college students, and with the help of social and electronic media, the information could go to millions of people. All societies should share their plans and activities, and organizations with the highest impact public awareness activities should be awarded. We should especially focus efforts on Facebook and Twitter to connect with millions of people. Our Young Neurologists Network on Facebook could be a great resource for this campaign. We should use multiple languages, especially Chinese, Spanish, French, Arabic, Hindi and German. We also could develop a 5-minute promotional video with a brief introduction of WFN in multiple languages. This video could be shared by millions through YouTube and Facebook. We have more than 140 member societies. If we are able to organize a few hundred programs on July 21 in all of those countries, it is bound to create an impact. Complexity of brain and neurological diseases often becomes a barrier for public awareness. “You should speak plain when you speak brain,” said Keith Newton of WFN. Our message should be simple and easily understandable for lay people. We could design a logo for this purpose which may be a simple global message. WFN and local organizations could start a poster or cartoon design competition to explain brain function and improve public awareness. Best posters, designs or cartoons could be awarded. We expect thousands of entries for this competition and some of these entries could become logos for our future campaigns. There are many organizations working in this area, including the International Brain Council, the International Brain Research Organization, the AmericanAcademy of Neurology, the International League Against Epilepsy and the World Stroke Organization. We should work with them for this common agenda. Strong liaison and lobbying with WHO is important. If WHO adopts this day in the future, this could be a great success for WFN. Wasay is the chair of the Public Awareness and Advocacy Committee for the World Federation of Neurology. Since we started this history column in 2010, we have paid attention to international relationships in the neurosciences, in particular the exchange of students and neurologists among institutes. In this essay, I will describe another way of international cooperation that coincided with the evolution of the specialization of neurology. In general, specialization in medicine is considered to have started in the second half of the 19th century. It was accompanied by the establishment of journals, societies, university chairs, the invention and application of new instruments (ophthalmoscope, reflex hammers, etc., for neurology), and the publication of comprehensive textbooks. 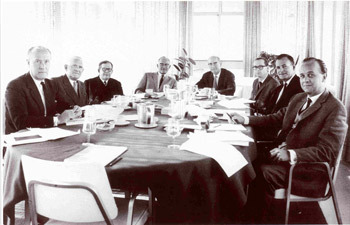 Editorial advisory board of Vinken and Bruyn in the 1960s: (L-R) M. Critchley, A. Biemond, R. Garcin, K.J. Zülch, S. Refsum, P.J. Vinken, E. van Tongeren and G.W. Bruyn. me Nerveux (1878), and Alexey Kozhevnikov’s Rukovodstvo k Nervnym Boleznyam i Psichiatrii [Treatise of Nervous Diseases and Psychiatry; 1883]. During this period, however, multivolume, multi-authored books of general medicine started to appear (Reynolds System in five volumes, 1866-79; Albutt’s System in eight volumes, 1896-9, Ziemssen’s Handbuch). 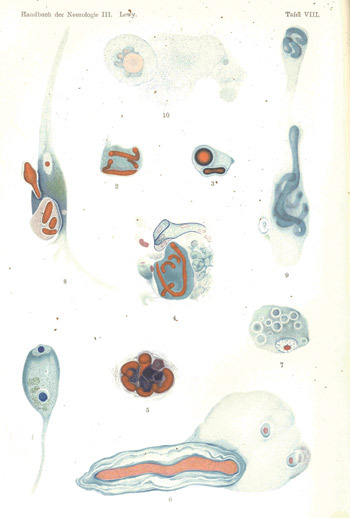 Although Dercum’s 1895 Textbook of Nervous Diseases was multi-authored (24), it comprised one volume. Hermann Nothnagel’s Specielle Pathologie und Therapie (1895-1915) was on general medicine, but possibly because of his interest in neurology, 17 of the 41 volumes were on neurological subjects, including well-known books by Freud, Hitzig, Möbius, Monakow and Oppenheim. With respect to neurology, it may be considered a kind of transitional book. From volume 10 of Bumke’s and Foerster’s Handbuch: pneumococcal meningitis. The handbook appeared in six volumes and was written by 81 authors, including 21 foreign authors. Due to Lewandowsky’s untimely death, supplements were edited by Oswald Bumke and Otfrid Foerster. Interestingly, the second supplementary volume contained almost entirely observations from war injuries of the peripheral nerves and spinal cord and was written by Foerster himself (altogether 1,152 pages). The same Bumke and Foerster continued the project with a new series of 18 volumes, published between 1935 and 1937. It is clear that the area of neurology had expanded and knowledge increased, but also became a more international undertaking with no less than 133 authors, of whom 45 were from 14 non-German countries. After World War II, a new project was started in the 1960s, when the Dutch neurosurgeon Pierre Vinken and neurologist George Bruyn launched the Handbook of Clinical Neurology. This project became even more comprehensive than Bumke’s and Foerster’s Handbuch. It was clear for them that the new series should be published in English (like Exerpta Medica that inspired them, for which they both worked and that was started in the late 1940s). They were able to engage a large international network of authors. The number of authors of the 78 volumes that Vinken and Bruyn edited (between 1968 and 2002) was 2,799 of which 48 percent was American. From volume 3 of Lewandowsky’s Handbuch: chapter on paralysis agitans by Forster and Lewy. Considering the publication of these three 20th century multivolume neurological textbooks, several changes in the field of neurology may be distinguished. Obviously, knowledge increased and more space was needed to describe it. Subspecialization within neurology is becoming evident in the course of publication of these volumes. Language now changed from German to English, reflecting the ever-changing teaching centers of medicine through the ages. While Paris, after Leiden and Edinburgh in the 18th century, had played an important role as the major center of medical teaching in the first part of the 19th century — resulting in a change from Latin to English and French — this gradually shifted to Austria and Germany in the 1860s. Following the two World Wars, English became the major language in (medical) science. Although basic neurological knowledge was spread throughout the pre-WWII German handbooks, Vinken and Bruyn emphasized the clinical aspect. Today, the three handbooks may be considered important sources for the history of neurology, reflecting the emergence of the specialty of neurology as a scientific and clinical entity. Moreover, it shows the increasing international cooperation throughout the 20th century. Koehler is neurologist at AtriumMedicalCenter, Heerlen, The Netherlands. Visit his website at http://www.neurohistory.nl. Koehler PJ, Jennekens FGI. Vinken and Bruyn’s Handbook of Clinical Neurology: A witness of late 20th century neurological progress. J Hist Neurosci 2008;17:46–55. World Neurology now has a superb Editorial Advisory Board, representing every region, and equally important, representing the WFN’s website and Journal of Neurological Sciences. In “@WFNeurology” on page 9, Walter Struhal and Peter Engel discuss the advantages of these linkages. Also in this issue, for the first time, you can see a list of some of the current articles in the JNS, with hyperlinks to the PDFs of selected articles. Similarly, when I receive announcements that require immediate display, I forward them to Engel for posting on the WFN website. This issue is the fifth online, with subsequent issues to come every two months. This is a good time to remind you that the content of World Neurology is entirely what you wish to make it. Please send me reports from your region, historical or personal reflections, notices of future events, letters to the editor, and of course, original articles on a topic that interests you. When you publish work that will later be submitted to a peer-reviewed journal, you don’t need to worry about copyright issues on the part of World Neurology or the WFN. You can help with our distribution list. Because many national societies are reluctant to release email addresses due to privacy concerns, our list serve is incomplete. Please ask your colleagues if they are receiving communications from World Neurology. If not, please advise them to send their address to me or to Keith Newton, assistant editor, at keith@wfneurology.org, in order to become a subscriber. If your national society can provide a list, please ask that it be sent to us. Finally, a wish for a happy, productive and healthy 2014 to all.